Are you looking for Amazon S3 bucket file upload from your web project using PHP technology, if yes take a quick look at this post demo. Amazon S3 is the best option to reduce the bandwidth cost as well file load time. Upload functionality is the most sensitive part in web project, one small mistake hackers will upload miscellaneous files. If you are connect with Amazon S3 you will be safe side. Download script contains four files. Login to Amazon account and click here to get Access Credentials. Here you have to provide amazon key details. The file contains PHP and HTML code to submit form. Create a bucket and right click select properties, add permission select Everyone enable check list box. This file help you to get file extension. //Here you can add valid file extensions. Yet another useful tutorial, I'm looking for multiple file uploader, will that be possible ? Can you share same like script for ebay????? Nice Work. Selecting multiple files at once? Any way to do this with media files? How would you tweek this so you can upload files that aren't just basic image files, like PDFs, or Zip files? @siddhu vydyas you can use a firefox extension called s3 organizer. and you can create a bucket. Nice I like it. Thank You..
Great job done here, many thanks for this code, I had no idea this is possible at all. And I also would like to say that you have a very informative blog in general, keep it up this way! Thanks for the code. Can i upload any video and audio files with mp3,mp4 extensions and if i can do can u please let me know where the code has to be changed and what has to be changed ? What should be the setting if one is not using the default us data center? Thanks,very nice post. Append folder name to $actual_image_name then it will put the file to FOLDER. Will this be a direct upload to the server, or moving it from temp directory to the server? In my bucket I have a folder, I want to upload the file to the specific folder within my bucket, how can I do that? In shared hosts running Apache + PHP, the maximum file size to upload will be fixed by 'post_max_size' or this rule will be bypassed? "In shared hosts running Apache + PHP, the maximum file size to upload will be fixed by 'post_max_size' or this rule will be bypassed?" Looks like s3 is not even called for until the file size is checked. This means you should be limited to the php.ini max size. Fill me in if I'm wrong. I am using this exemplo to upload my images. I am try to send to S3 some resize images. I send the original photo and after I need to resize this image and send to S3 the resized images. How can I resize a image and send to S3? Good night Srinivas Tamada. You have a great article and very informative website. But with this script, I have a problem. The fact is that I have no way to change the time zone on the server. what to do in such cases, how to deal with the problem?. I will be glad to hear what you think about it. How do I set the storage type to 'reduced redundancy'? I'm with Chris for the use of `pathinfo()` function. this trick is really useful .. thanks many more .. But in my case, how i can write api upload file to S3 for mobile? Please let me know , How to store media in REDUCED_REDUNDANCY format. very useful tool - How to upload a file to a subfolder? Helllo dude Amazon S3 buket is free ... na ??? Is it possible free at Amazon ?? I am getting the below warnings and I am not able to upload the images to the bucket. that was an awesome work.I would like to know one more thing.I am using S3 buckets to store my images and I need to fetch these images to my local machine and compress these images and then upload to CDN's.This works good.But when I had enabled a load balancer its not working.Any idea why this happens? is it safe for wordpress, joomla sms plugins? i want to move file's from one directory to another directory on same bucket in aws s3 server. help me .i want to upload image amezon s3 server same bucket but different folders. i am using this code the problem is when i upload image it display the image upload fail. It's working fine but I need help that If we make that private then how we can access image. Please can you please help me out of this. When I use this code and provide a static path to upload single file already exists in server, It'll work fine. But If I get paths from database, create a loop and upload them to s3, I am getting this Fatal error: Maximum execution time of 300 seconds exceeded in s3upload/S3.php on line 829. Can anyone suggest me any solution?? Deployed it to Heroku. Really cool! This is great. hi, i am trying this from last 2 days but its give error again and again whenever i try to upload file. errors are : access denied line 188 or line 312 in s3_config.php. hi . i am trying this amazon form last 2 days but i got error again and again whenever it try to upload kindly help me . error was .. ACCESS DENIED ON S3_CONFIG.PHP line 188 or line 312 . I got the same problem. What should i do now? I also keep getting the S3 Upload Fail. Is there something I'm missing? Help is much appreciated! Having question here. Can we get request URL like with extension .m3u8 and .hls from s3 bucket ? Can any one please advise how to upload image in subfolder inside a bucket? hello i used this program for upload file in amazon server. my file upload correctly.but i got two errors. please solve this error ASAP. Can you let me know how to upload image in folder inside a bucket? Its been a couple of hours since I create the bucket. It works with default region, but if the region = us-west-2, then how to include it within the code? This upload functionality works with default region, but if the region = us-west-2, how do I include it in the code? For now I'm experiencing "S3 Upload Fail" as I couldn't include region in your code. So please help me ASAP. Hey, I get the same error! This code used to work with my old bucket. the new one fails. Did you manage to fix this or any other solution? Cross verify the file size limit condition. Warning: S3::getBucket(): [InvalidRequest] The authorization mechanism you have provided is not supported. 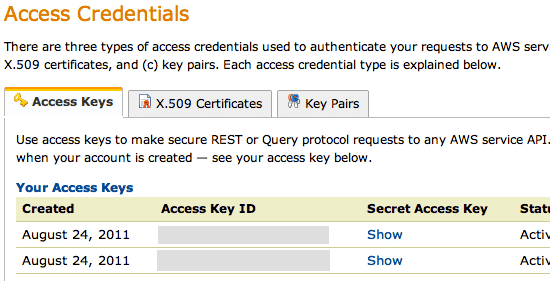 Please use AWS4-HMAC-SHA256. Hey Ajay, I get the same error!